What Brand spark plug wires are those? I was looking all over for an air canister like the Fiero's that has an offset inlet. That's the challenge right there. Looking good. Pics take me back to when I was doing mine. I loved coming up with new ideas for any problem I faced. 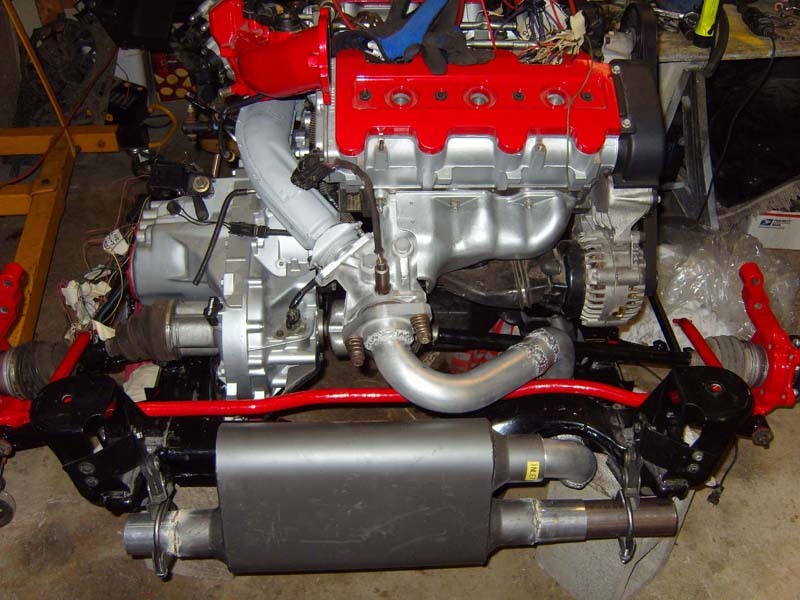 If I ever had to do it again, I'd do another 3.4 DOHC. Hell, after you finish one, you know all the problems before hand. I'd be able to cut my install time by about 80%. I really like the stock style air cleaner look you have going on, and the 4th motor mount. (wish I thought of that). One thing I'd do differant is with the 96-97 intake/elbow/TB setup. I spend so much time looking it over, i think i'd take it to a machine shop, have two small hose adapters welded in for the coolant hosed, remove the TB mount, so the upper and lower intakes can be free of each other. Then make a 90 elbow off the Upper Intake to move the TB up and away from the stock location. Just too much going on in that area. I had fuel lines, coolant lines, shifter cables and air intake all fighting for the same real estate. Nice, clean swap! Good job man. Do you have any concern about the exhaust holding up against motor movement & vibration without a flex coupler? The 91-95 motors had a flexible spring-loaded cup joint on the rear manifold dump, which prevents engine movement from stressing the exhaust, but I see that with your 96-97 era motor it's a flat bolted flange. I didn't actually do the swap, Fieroking did. He has a similar exhaust set up in his DOHC car and it has been running for a few years with no exhaust issues that I'm aware of. His exhaust setup has the spring-loaded connection I was referring to. This gives it some flex. Ah, I see what you mean. I'll ask Joe about it. "I don't think there will be a problem there is not a lot of movement and the mounts for the exhaust are pretty tight. My exhaust wraps around the cradle were yous is more of a straight shot to the muffler." So we'll see how it holds up. Any new progress, or are we done till next summer? What? I didn't do enough? There are a few things that I'm going to do here soon, nothing major though. I'm still having a few issues with the tach, it looks like the Dakota Digital SGI may be faulty and has to be returned for a replacement, and it also looks like one of the axle seals is leaking. 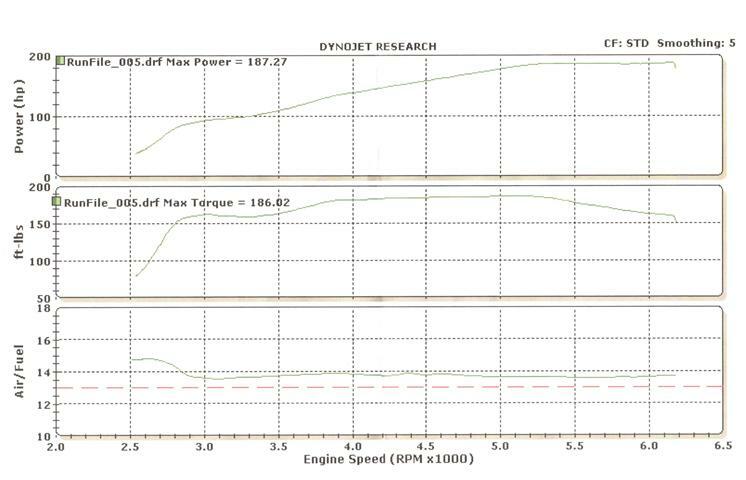 I did have the car on a dyno when I picked it up. If I can find the slip that I brought home I'll post it. Oh I think you've done more that enough for now, it's just that some of us know what you are capable of! Besides, those of us who tinker with projects and upgrades enjoy watching those who accomplish them in short time...kind of like an inspirational shot of visual adrenalin. This is when the engine had less than 100 miles on it. 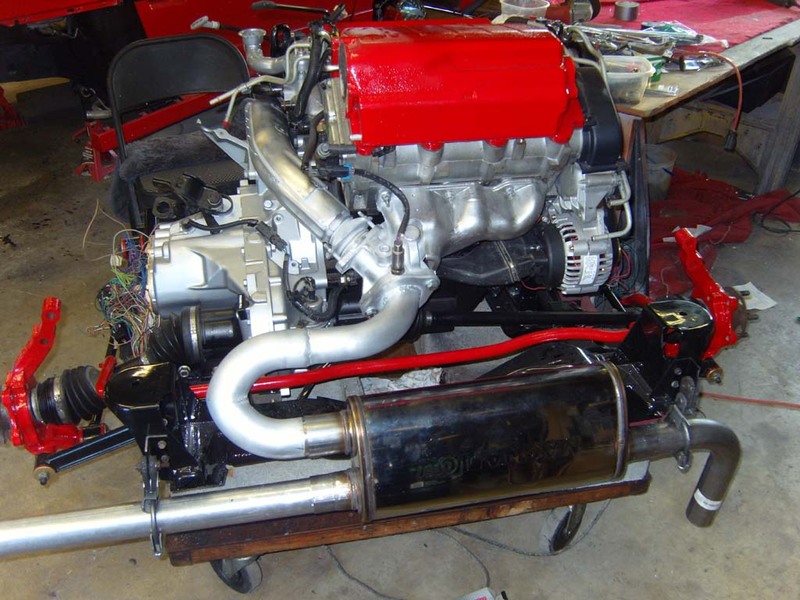 The engine was tight and the consensus from the speed shop was that the hp and torque would go up once the engine was broken in and should be about 205 HP and 210 torque at the wheels. OK, here's an update. Not pertaining to the swap but some additional work that I have done. The inside of my decklid isn't black it's more of a blue/grey colour. Most other Fieros seem to be black on the underside of their decklids so it's been bugging me. I had also purchased a mirror set from Snapperhead (excellent products by the way ) a few months ago so I figured now was a good time to do something about it. See what I mean about the colour of the underside? I had painted the underside of my hood last winter and installed Snapperhead's acrylic mirror set this week too. And... Woot, in the "Construction Zone"
The Construction Zone is a well deserved location for this build! Painting the undersides of the hood and decklid really cleans things up and gives it that fresh " New Car" look. Definatly going to do this when it comes to paint time. Yes, it makes a world of difference. Awesome swap!! Looks great!! i wanted to do this swap but then changed my mind! I still have the engine if anyone is looking for one or one for parts! ..sorry dont mean to hi jack! I love your car. Haha. Very nicely done. What I was finding was that the tack worked perfectly well up intil 5300 RPM. Anything over that and it would drop to Zero until the RPM dropped below the 5300 threshold. I tried all the claibration steps outlined in the instructions and went though all the connections but couldn't find the cause. I sent the unit back to Joe at his request and he tested the unit on his 3.4 DOHC car with a spare VDO tach that he has and he had the same problem. Joe contacted Dakota and it turned out that because there are only 3 coil packs the SGI unit had to be set for 3 cylinders not 6. Joe retested it and confrimed it operates correctly and it's on its way back to me. Just a heads up for anyone else who is going to use one of these modules as this isn't defined in the instructions. it the tach issue what kept you from running up to 7k? first time i have seen the mirrors. they look sharp. No, not at all, they don't use the vehicle tach on the dyno in any event. Can you give me some more information on the tach? Use a 95 Monte Carlo "8k" tach and a DakotaDigital controller needs to be used? I am curous why the 3.4's ecu wont control it. Great swap BTW, excellent workmanship! The tach being used is a VDO tach, not a GM tach. According to the VDO literature it's supposed to work with the stock signal from the 3.4 DOHC ecm however, it won't work. The SGI unit adapts the signal and the VDO tach works fine with it. I didn't actually do the work Je (aka Fieroking) did the work. If you need more detailed information you would have to contact Joe. Yes he did a great job. Tachometer is controlled by the ICM board, not the computer. Absolutely Beautiful !! What else can I can say. Oh and thanks for the thumbs up. Thanks Vince, and you're welcome! sourmug. good to see shes still going. msg me if you go to the a&W with the other. me and chris should have ours out this summer hopefully with all the goodies we bought from u. Yes, I go the the A&W meets. You guys should come out, we would love to see what you guys have been doing. Amazing build, a definite favorite of mine. Wondering where you got your front lip from?